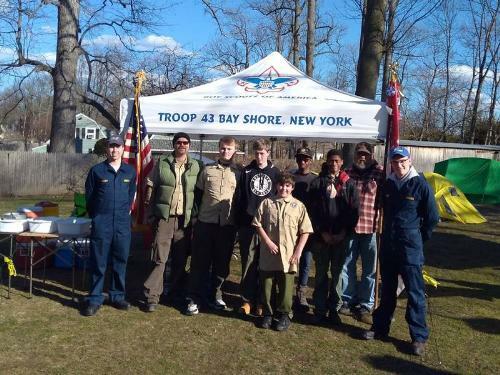 Troop 43 meets on Wednesday nights 7:00 - 8:30 pm at Gardiner Manor Elementary School located in Bay Shore. We are an all inclusive Troop, as of February 1, 2019, and invite any eligible girl to join the Troop. 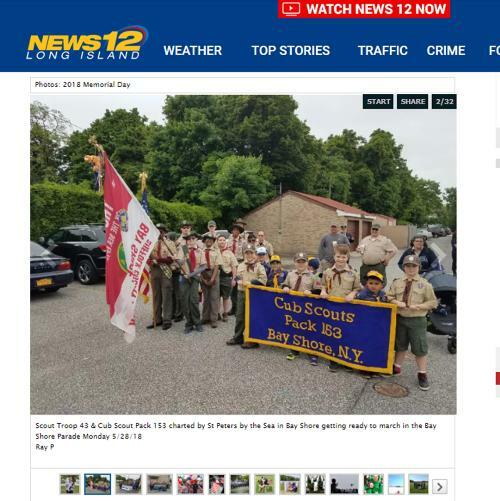 Welcome to Troop 43's Website! 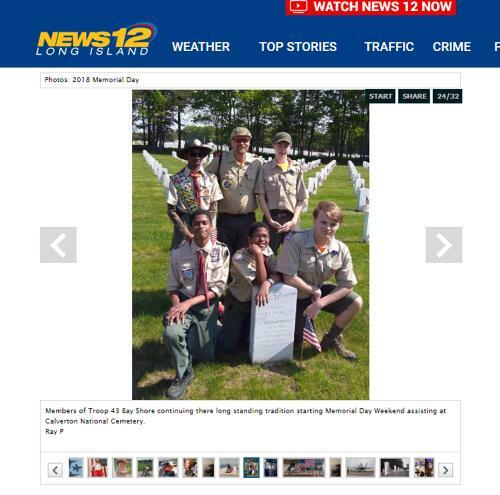 Troop 43 is an example of a traditional “Scout Lead Troop” or you might say “Old Fashioned” Troop. Often, we have a true camping experience, in any kind of weather. This means sleeping in tents, cooking on an open fire. We also enjoy long hiking weekends and new adventures. 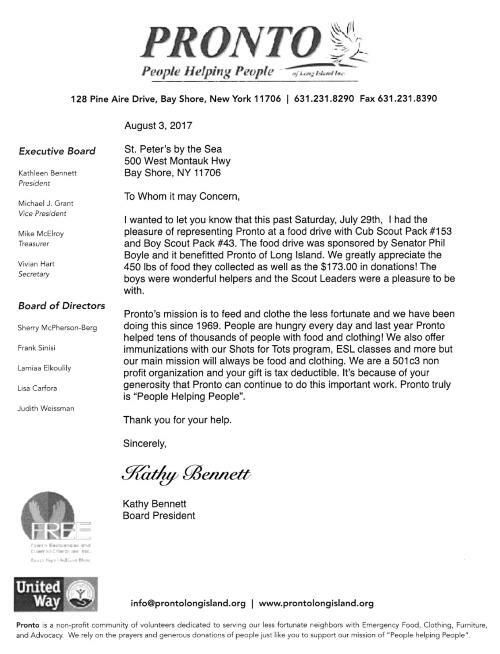 Troop 43 was first chartered in 1940 in the Village of Brightwaters, we were then chartered in 1958 by the South Country Elementary School PTA. 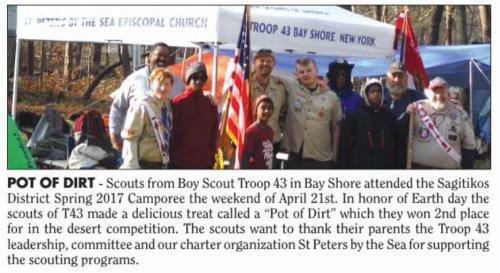 In 1965, we were chartered by St. Luke's church, and most recently, from 1971-2019 we were chartered by St. Peter's by the Sea Episcopal Church in Bay Shore, New York. Troop 43 has a rich history of over 60 Scouts achieving the Rank of Eagle Scout! In the past few years, we have had over 14 Scouts achieve the rank of Eagle Scout. 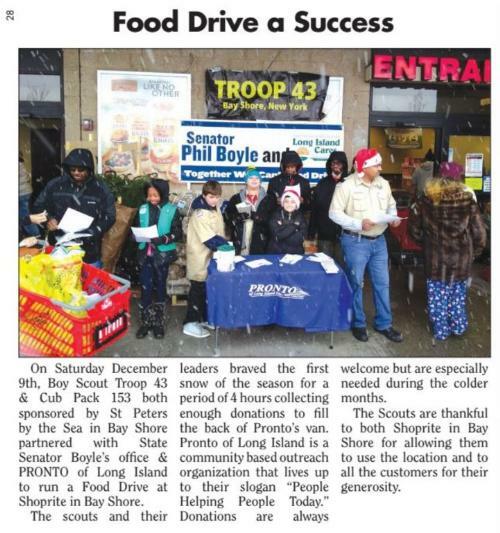 Please come visit us and become part of Troop 43. All boys and girls ages 11-17 are welcome to join us. 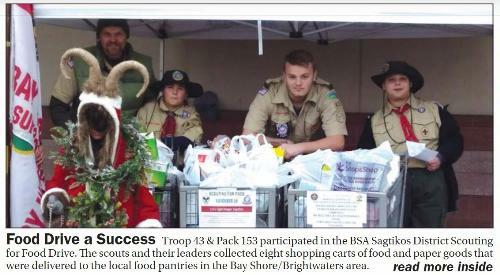 Scouts BSA helps turn kids into tomorrow’s leaders. With more than 130 Merit Badges—from Archery and Art to Welding and Wilderness Survival—Scouting is the ultimate form of learning by doing. 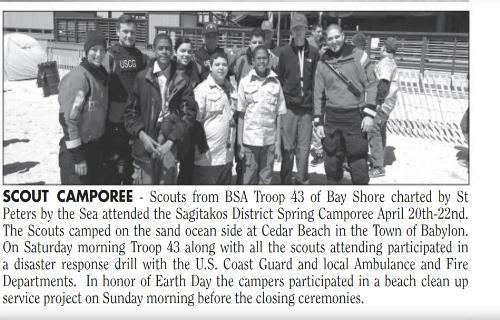 Scouts BSA explore their interests and improve their skills while working toward Scouting’s highest rank: Eagle. 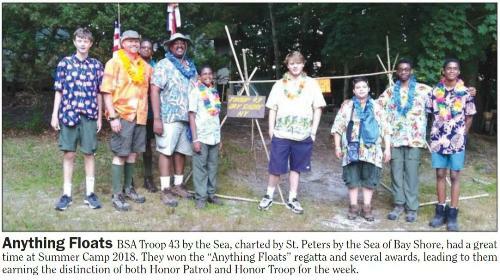 By first imagining, planning, and then doing, their own service projects, Scouts learn the value of hard work, and experience the thrill of seeing it payoff. Add in outdoor adventures, hiking and camping, and Scouting gives boys and girls, all the experience they need to become leaders. 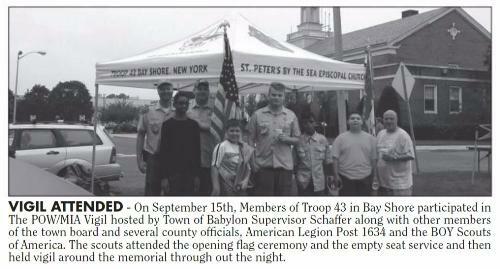 Troop 43 meets on Wednesday nights7:00 - 8:30 pm at Gardiner Manor Elementary School located in Bay Shore. 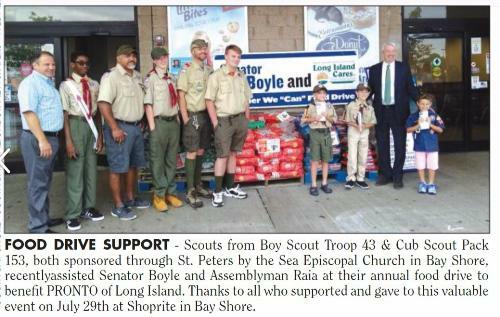 Troop 43 has had many benefactors over the past 60 years, but a few benefactors have stood out. 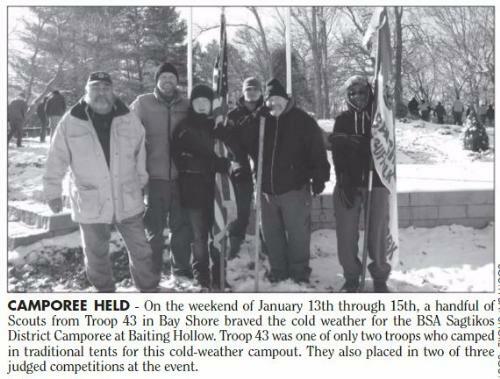 The Troop Committee, Scoutmasters and Parents want to recognize the contributions these individuals/families have made and continue to make to Troop 43. Within Troop 43 we have "Hesselbach wood" but what is that exactly? Phil generously donated scrap wood from his carpentry shop for the Troop to use for fires at camp outs! 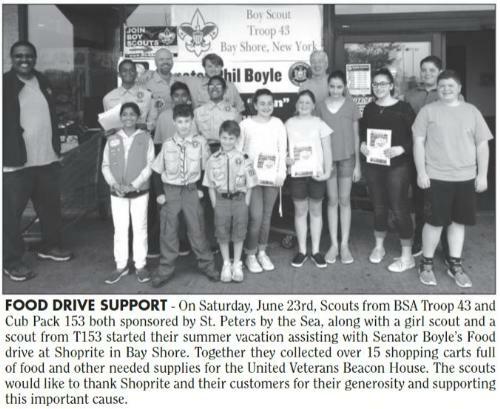 Phil also used his expert carpentry skills to donate four Patrol Chuck Boxes to the Troop. Sharon was always very eager to help with fundraising. 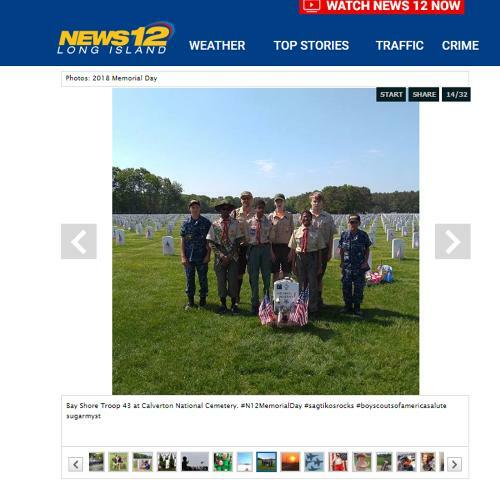 Phil and Sharon's sons, Patrick and Brian are Eagle Scouts. Silvana has served at almost every level of leadership within Cub Pack 43 and Troop 43, she retired as Troop Advancement Chair, she is always on call if needed. Hugh has donated his graphic art skills many times to projects: Lettering on the Troop Trailer and Glass. Silvana and Hugh's sons, Abel and Daniel are Eagle Scouts. 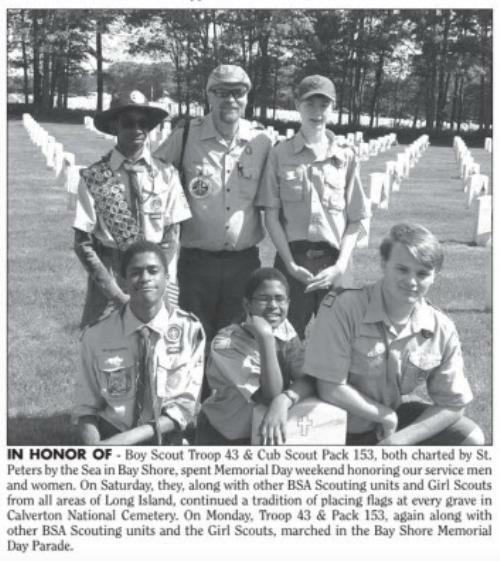 Carl has served as a Committee Chair of Troop 43 since 2011. 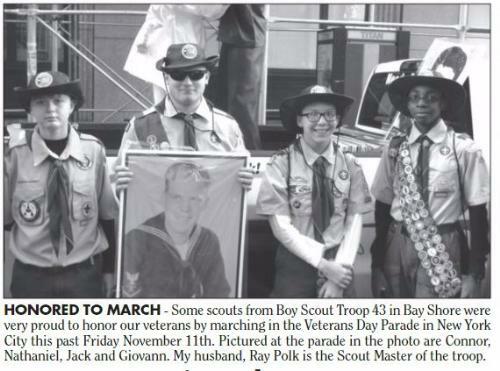 Any time the Troop needed materials, he found a donor. 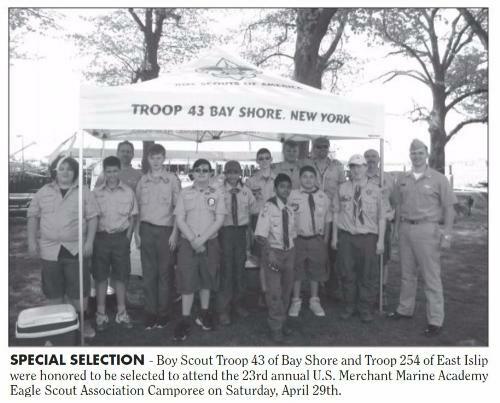 The Troop Trailer, pop up canopy, tents, grills and many more items where always donated anonymously. Heidi spent many hours putting together fundraisers. Carl and Heidi's son Carl William is an Eagle Scout.